The mass media played a crucial role in the Election Commission Nepal’s voter education campaign—conducted with support of UNDP’s Election Support Project—for the 2017 local level elections in helping to bring information regarding the voting process and the importance of taking part in polls directly to people’s homes through targeted messages disseminated through radio, TV and social media. This view, expressed by Budhanilkantha’s Binod KC, is representative of many general voters across Nepal, who were spurred into action during the 2017 local-level elections by mass media messages designed to increase understanding and encourage more participation in the polls. 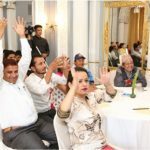 As it had been around two decades since Nepali voters had cast their votes for representatives of local governance bodies, and since there were a number of new features added to the 2017 elections—including very complex ballot papers—passing on information about the voting procedure became particularly important. In this context, UNDP’s Electoral Support Project (ESP) had supported the Election Commission of Nepal (ECN) to organize a massive voter education campaign, in which the mass media played a key role. Information was disseminated through various forms of electronic media—radio, TV, cinema and SMS—employing public service announcements (PSAs) for the most part but also making use of regular TV and radio programmes on occasion. Specific messages targeting women, Dalit and youth participation were also developed and produced in Nepali and four regional languages. PSAs on radio and TV relayed information related to the electoral process—such as how to vote, when to vote, how to fold the ballot papers, the election code of conduct, different posts for which candidates were to be chosen, participation of women, and details about polling centres—while regular programmes enabled in-depth coverage of different relevant issues. Former Chief Election Commissioner Neelkantha Uprety is an avid viewer of ‘Nirwachan Sarokar’(Election concerns), a TV show devoted to electoral discussions, and commends the programme as being “an effective means of presenting information, and experts” and general people’s perspectives through reports and interviews in a clear, simple style.” He hoped the show would continue to broadcast beyond the election period. This sentiment is reiterated by people in the field. “I was not much aware of the voter registration process until an election programme on TV that was talking about voter registration and voter list updates at the local level pushed me to take my family to get registered at the rural municipality office,” says Uttam Sinkhada from rural Dhading. ESP had provided support to the ECN for the production of TV and radio PSAs, radio jingles and the regular radio and TV shows. These were aired on Radio Nepal and more than 150 local FM stations across the country, and via Nepal Television and 12 other national TV channels throughout the election period. The ECN had also ensured further dissemination of the messages through social media.